During the school year, my time to spend raiding pantries is fairly limited. I’m either in class, selling skin care products, or studying and by the time the weekend rolls around, I’m about ready for a waiter to ask me what I’d like to order. While I cook plenty of meals in between, it’s tough to find a moment to buckle down and write about it. Now that it’s summer, I’ve got a lot more time for this here blog. Don’t get me wrong; I’m plenty busy. I’m about three weeks into my internship at Marlo Marketing, where I help out on the restaurant PR team. In other words, I spend my days scouring food blogs, restaurant reviews, and Eater/Thrillist/Urban Daddy newsletters for any mention of one of our beloved clients. Translated, this means I’m always hungry. While working 9 to 6, five days a week really takes it outta you (seriously grown ups, how do you do it?!) the good news is I get to leave my work at the office. So, when I get home, I have time to cook, snap photos, and write to my heart’s content. If you’ve been paying attention, that explains the higher frequency of posts, as of late. Combing through all of these magazines and articles for mention of Clio, Tavern Road, Shake Shack, or any of our other tasty clients exposes me to a lot of other delicious ideas, such as recipes for sour cream swirl brownies and panzanella salad. While reading Daily Candy one afternoon, I stumbled upon a recipe for Vietnamese Noodle & Beef Salad imagined by designer Diane von Furstenberg’s personal chef, Jane Coxwell. I’m a big steak enthusiast, but usually stick to what I know (salt & pepper, seared on each side and then flash broiled in a cast iron skillet), but I’ve been on an Asian food kick lately (get at me, fish sauce) and this looked too good to pass up. It stayed on my “Recipes” Google Doc until just yesterday, when, after coming home from the beach and feeling drained from the summertime sun, all I wanted was something refreshing and light. I opened my handy dandy Google Doc and re-discovered this awesome recipe. After flaunting my fancy new tan lines on the walk to and from the grocery store, I whipped up a variation of the recipe that I’ll surely make again and again. With a few Asian cooking staples in your kitchen like rice vinegar, fish sauce, and soy sauce, you’ll only need to pick up a couple of other ingredients and you’ll have yourself a sweet, refreshing, and umami rich meal. This recipe is incredibly easy to whip together and can be made in 20-ish minutes. The rice vinegar dressing that’s poured over the salad soaks into the medium rare beef and saturates it with a sweet-meets-salty flavor. Though the beef is heavy, when paired with chewy rice noodles, velvety avocado, and refreshing mint leaves, you won’t feel weighed down when you’re done eating. The soy sauce marinade that coats the noodles unifies the lighter ingredients and the steak with a slight umami flavor that’s simply mouthwatering. Side note: This salad goes great with a minty lemonade cocktail. Muddle one sprig of fresh mint at the bottom of a glass. Add ice and fill with lemonade. Pour in one shot of white rum, such as Bacardi, and mix. 1. Combine all dressing ingredients in a jar and set aside. 2. Heat olive oil in a medium size skillet over high heat. Sprinkle salt and pepper on both sides of steak. Once oil is shimmering, add steak, cooking for 3-4 minutes on each side, until medium rare. Set aside. 3. Boil water in a medium pot. Cook rice noodles for 4 minutes, or according to package directions. While noodles are cooking, thinly slice steak on the diagonal (against the grain). 4. Drain noodles and place in a bowl. Pour in soy sauce, fish sauce, sugar, and lime juice and gently toss to coat. 5. Serve noodles in personal bowls. 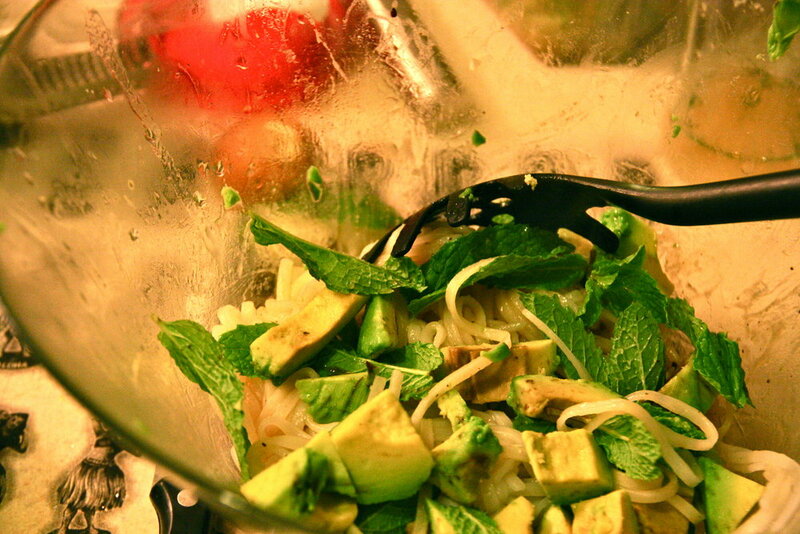 Top with avocado and whole mint leaves. 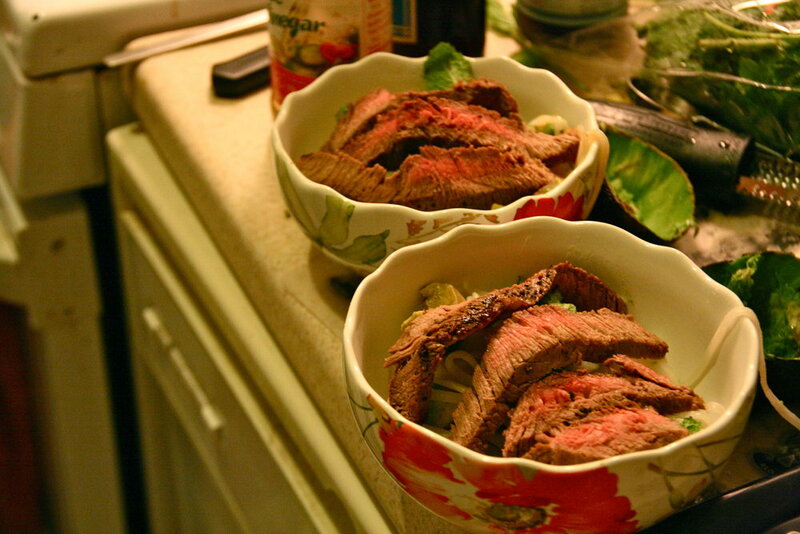 Lay strips of steak over the top. Shake jar of dressing and then pour over the steak and noodles. Garnish with a single mint leaf and serve immediately.